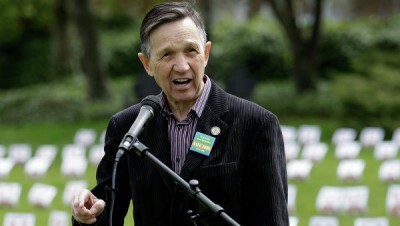 Rossiya Segodnya sat down recently with Dennis Kucinich, Former US Representative from Ohio and two-time candidate for the Democratic presidential nomination. He spoke about the recent elections, the situation in Ukraine, and the need for America to shift its foreign policy away from the notion of perpetual war, to perpetual peace. Hello Dennis, Thank You for speaking with us, one of your most recent political drives has been “Redefining National Security From Terror to Peace”. What does the Republicans’ victory in midterm elections mean for US national security? Dennis Kucinich: American people define national security as human security, as the security of a job, decent wages, healthcare that is not determined by insurance companies. They determine national security in terms of human security with respect to education of the children, safe neighborhoods, clean air, clean water. They talk of national security in terms of the protection of their civil liberties, the right to be free from government spying, intrusion into private communications. And they speak of national security in very personal terms that again can be described as human security. When Washington speaks of national security, Washington means perpetual war and the rise of a national security state with the military industrial complex determining the priorities of the country, and the intelligence agencies getting more and more money to reach more deeply into the personal lives of American people. So, there is a great divide here. Because the Democratic party voted most recently to support giving arms to the so-called Syrian rebels, the democrats once again voted for war. And the party has consistently voted for war. It has not distinguished itself from the Republican Party on matters of perpetual war which means that there is a vacuum in American politics. There is a vacuum with respect to addressing the need of the people for jobs, the need of the country for rebuilding its infrastructure which is in need of trillions of dollars worth of repairs, and the need for redefining America’s role in the world as a means of recognizing that this is not a unipolar world. This is a world of multiple interests and multiple countries. It is folly for any nation including America to try to sell itself up there as the only nation that matters. Indeed we have to be ready to recognize the concerns of all people. Will the President allow the expected Congressional increase of sanctions against Russia and Iran? Dennis Kucinich:The United States is going to have to move into a position of economic leadership for the people here at home. We have to start taking care of things here at home. And we have to stand for human rights here at home. So again, there is a vacuum. Neither party has addressed this. We have not honored an international system of checks and balances. We need to realize that the cohesive force in the world is human unity, that we are interdependent, and interconnected. And for that reason the use of force undermines America’s position in the world community. The arbitrary use of force, the illegal interventions that have occurred undermines America’s moral authority and undermines our own national security. We have to be very careful that we do that squander the resources of our country in perpetual war. And yet both political parties have failed to come up with a means of taking a new direction. Certainly, this 2014 election isn’t going to bring any dramatic change in the direction America has already taken. We have to understand that continued unilateralism and interventionism abandons the world order and makes the world a more dangerous place for everyone including Americans and helps to fuel the ambitions of extremists. We have to envision a new world and act upon a vision of the world as one. The world is interconnected and is interdependent, and our policies should be aligned with that. Do you consider American elections to be transparent? Some experts believe that money has is the defining feature of elections, where costly ad campaigns can be decisive. For instance, this election cycle has been the most expensive yet. What can be done? Dennis Kucinich: There will be a minimum of 4 billion dollars spent in this election. That ton of money makes a mockery of elections. It makes of government an auction, where policies go to the highest bidder. It means that America has entered a political gilded age which is not worthy of our higher aspirations. The Supreme Court decisions on money in politics have been some of the worst decisions that have ever been made in American history with respect to protecting our democracy from rapaciousness of certain economic interests. The country is very vulnerable right now to rule by money interests with very little opportunity for people to be able to have their practical needs addressed. And those money interests include those who are profiting from war. The 2014 elections did not address the economic issues of the American people, did not address the human security issues of the American people, did not address the cost of America’s overreach into perpetual war, did not address sufficiently the role of government in setting up a national security state that’s inimical to the high principles on which America was established. Though the Republicans won a major victory, it is more a commentary on the fact that the Democrats have not offered an effective alternative. When the Democrats held power when President Obama was elected in 2008, at that very moment a dramatic plan for economic reform needed to be brought forward. But what happened instead was that it was all about service to Wall Street at the expense of Main Street. And more money was transferred to top. And the economic system at that point needed dramatic reform, in terms of making sure that resources of the country got to Main Street. That was ignored in favor of, basically, keeping the present system in place. America is so much better than this. It’s so much better than the situation right now which is the corruption of elections by big money, and the failure of the Supreme Court to protect the interest of the people, the failure of the Congress to address the economic problems. Do you believe that these issues will be addressed in 2016? Dennis Kucinich: The election in 2016 is going to offer a new opportunity to refocus on economic issues in terms of job creation, and new jobs, and trade. The question is can the United States move towards a full-employment economy? Can we rebuild our infrastructure? Can we have monetary policies which are consistent with full-employment and with a rebuilt America? Can we fashion for the US a new role in the world as a nation among nations and not a nation above nations which brings with it a heavy price tag for endless war? That’s what 2016 is going to be about. It is also going to be about whether this vacuum which the two parties have created by their lack of responsiveness to the practical aspirations of the American people, whether the two party system will receive a significant challenge in 2016. But certainly, at this point, it is worth mentioning that economic problems are likely continue to be ignored as they have been in last few years, that the American people who expressed their dissatisfaction (in midterm election) with the status quo will continue to express their dissatisfaction in one election after another, until at last the yoke of economic hardship that has been put on the backs of so many American people is lifted. We have to do something about the political system where corporations have captured both parties. That massive $4 billion that went into the campaign facilitates a massive wealth transfer upwards, facilitates more war, facilitates more trade deficits. And it’s really the responsibility of both parties. There is great celebration of Republicans today, and there is a great deal of apprehension among Democrats. But that pales in comparison to the conditions which are affecting the people of this country which are not being addressed by either party. How do you think the outcome of these elections is going to affect Ukraine? Do you think the US will supply arms to Kiev now? Or will they try and handle this as a political matter instead of a militaristic one? Dennis Kucinich: I think that the world community needs to give the people of Ukraine and the people of Russia an opportunity to work out their difficulties for good without outside interaction. It’s quite regrettable that the events in Ukraine were triggered by my country’s involvement in a coup proving once again that America really needs to pay attention to things closer to home that respond to practical needs of the people. Our founders warned about being involved in foreign intrigues. That seems to be a lesson that has yet to be learned. The other thing I want to say, the West gave Ukraine a non-negotiable demand that did not benefit the people of Ukraine. And what that non-negotiable demand included was putting NATO at the Russian border. And that was not a defensible position. The proposed agreement did not provide for the people of Ukraine to have the kind of movement throughout the European Union which would provide for the kind economic freedom and the economic opportunities which the people of Ukraine have been looking for. The bottom line is as we like to say in the US the people of Ukraine were not given a very good deal. And when the government of Ukraine didn’t accept it, the government was overthrown. We have to find a more logical, coherent and sane way of conducting our international relations. Do you expect serious changes in US foreign policy over the next two years? Dennis Kucinich: The next two years I would not expect to see too much changing internationally, because America can not afford to plunge deeper into these wars. The US involvement in Syria has been characterized as one blunder after another. We switch sides so quickly that we are chasing our shadow now. This is a very dangerous position to be in, now to the extent that we have created and unleashed forces that are not easily contained. And the solution is not going to be more violence. The US truly must work to reestablish friendly relations with the government and the people of Russia. There is absolutely no reason why we should permit the reemergence of cold war psychology, because we remember from the last cold war that the only people who benefited were the arms manufacturers. Our people have much in common and we need to focus on that again. I intend to continue to travel the country to talk about the importance of America taking a new direction and in making sure that our national security includes a discussion about the imperative of jobs, and wages, and healthcare, and education, and housing, and our constitutional freedoms. That is part of our national security as well. And I’m not the only one saying that, I am getting that directly from thousands of people who I met in the last months while travelling the country.